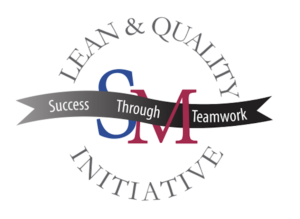 Initially originating in Japan, the concepts of LEAN can be universally applied to nearly any process. Some concepts of LEAN go back as far as the pre-20th century, with ideas such as the “Five Whys,” a strategy to determine root cause, commonly being attributed to Benjamin Franklin. Franklin’s publication, Poor Richard’s Almanac also included many ideas which remain cornerstones of the LEAN philosophy. Industrialist Henry Ford also understood the importance of waste reduction when he established the first mass production assembly lines, emphasizing standardization within processes and pull systems. In around 1934, Japanese automaker Toyota began utilizing the Just in Time (JIT) methodology, focusing on reducing time within the manufacturing process as well as reducing the strains of inventory management by producer and buyer. Due to the conditions in Japan during the post-war period, they were forced to alter their manufacturing processes and “LEAN out” their companies. This achieved lower inventory levels, while investment in in-process inventories was kept at a minimum. The cost of purchased resources was offset by quickly using them within the manufacturing process through the use of one-piece flow and rudimentary pull systems. Eventually, this methodology gained momentum in the United States and other western countries, evolving into what it is today. The end goal of LEAN is to reduce waste from processes. Waste, in this case, can be defined as, “Anything other than the minimum amount of equipment, materials, parts, space, and workers time, which are absolutely essential to add value to the product.” There are many tools provided within LEAN ideology, and these tools can be applied in a variety of combinations in order to achieve the desired effect within a company. LEAN Six Sigma applications allow Sanderson MacLeod, a Palmer, Massachusetts based manufacturer to produce twisted-wire brushes more efficiently and effectively, ensuring ever-improving intercompany communication, data-driven decision making and individual performance measurement. The benefits of introducing LEAN initiatives into a manufacturing company are clearly demonstrated through the success of Sanderson MacLeod. Enhanced inventory control systems, product use analysis, and on-floor production optimization save customers money in innovative ways. 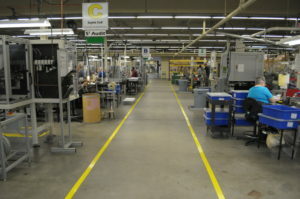 Sanderson MacLeod has been widely recognized as a LEAN Manufacturer, leading to awards such as Business of the Year, Employer of Choice, the Super 60 Award, ABMA’s coveted William A. Cordes Innovation Excellence Award and most recently the Associated Industries of Massachusetts Sustainability Award. Sanderson has reduced scrap to below 2% of parts produced, down nearly 10% over a ten-year span. 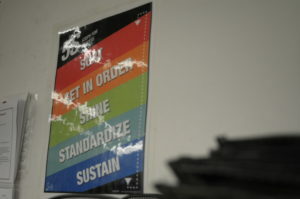 Overproduction is also considered an area of waste, and through its LEAN practices, Sanderson has dropped from +/- 15% over/under production to less than .005%, which allows the company to maximize equipment utilization, labor and materials while simultaneously and accurately reducing lead times. Further, Sanderson MacLeod customers can expect 99.7% on-time delivery, as well as detailed analysis and documentation using their recently introduced “ION Tracker” reporting system. Their latest efforts are expected to further increase client inventory reduction, enhance internal processes that save money for both the manufacturer as well as the purchasing company. Sanderson MacLeod is a contract manufacturer specializing in domestically-produced twisted-in-wire products, including twisted-wire medical brushes, firearm cleaning brushes, cosmetic brushes and general purpose cleaning brushes. Established in 1958, the company employs approximately a 120 people and operates a modern 137,000 square foot facility in Palmer, MA.